Yukon has over 30 listed paragliding sites. 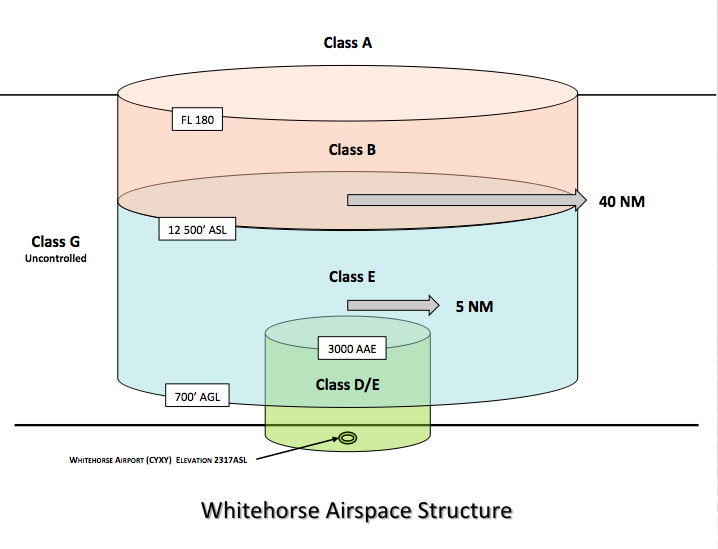 Many of those close to Whitehorse are in Class ‘E’ airspace which requires pilots to have their HGAR. The Whitehorse tower operates visually and relies on good communications in order to help aircraft share airspace safely. Pilots should contact the Whitehorse tower before launching and after landing at all flying sites in the Whitehorse vicinity. Two seasonal flying sites are within the Whitehorse Control Zone, thus pilots are required to have the HGAR and an Air-band Radio. 601.09 (1) Subject to subsection (2), no person operating a VFR aircraft shall enter Class D airspace unless the person establishes two-way radio contact with the appropriate air traffic control unit before entering the airspace. (2) The pilot-in-command of a VFR aircraft that is not equipped with radiocommunication equipment capable of two-way communication with the appropriate air traffic control unit may, during daylight in VMC, enter Class D airspace if the pilot-in-command receives authorization to enter from the appropriate air traffic control unit before entering the airspace. (3) Class D airspace becomes Class E airspace when the appropriate air traffic control unit is not in operation. aircraft, and upon request between VFR aircraft. appropriate ATC unit is not in operation. classified as Class D airspace.